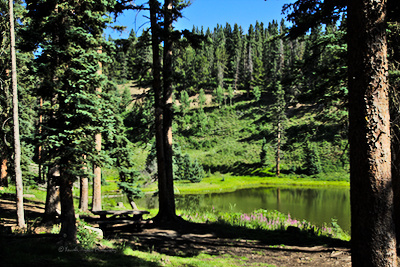 A popular campground in a spruce forest for fishing in the nearby lakes. When we were there, one person told us he hit his limit in just an hour or so. Many of the campers around us were eating meals of fresh fish. Region: North-central; Sangre de Cristo Mountains. Campsite count: 9. There is room for more people to camp than just the sites with tables. Visual density: 8.00. 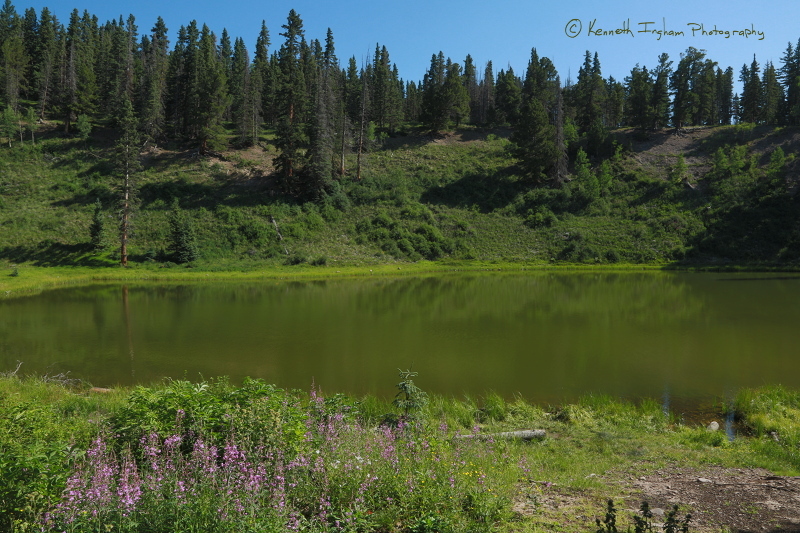 Actual visual density depends on if people are doing dispersed camping. Season: June 01 to September 30. Actual season depends on weather. General RV notes: Several large fifth-wheel trailers made it to the campground, but they were all near the entrance. The "roads" in the campground have tight bends and are rough. General notes: This campground was 3/4 full during the week and overfull on the weekend. It was full by Friday noon, and people were squeezing between campsites (as designated by tables) by the evening. Campground facilities: vault toilet(s) (Someone had taken a crowbar to the door so it could not latch closed.). 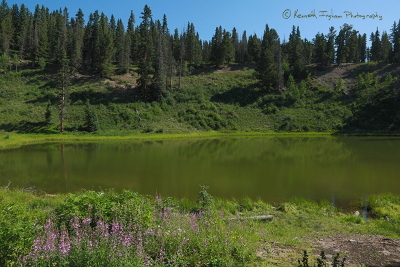 Campground attractions: hiking, wildflowers, fishing, lake, stream. Cleanliness: 8. Only a few pieces of litter, but there was some broken glass, and litter in the fire ring. General notes: The toilet was reasonably clean, but ran out of toilet paper quickly. Additionally, someone had used a crowbar on the door, so it would not latch closed for privacy. The good news is that (at least when we visited), the route was well signed. 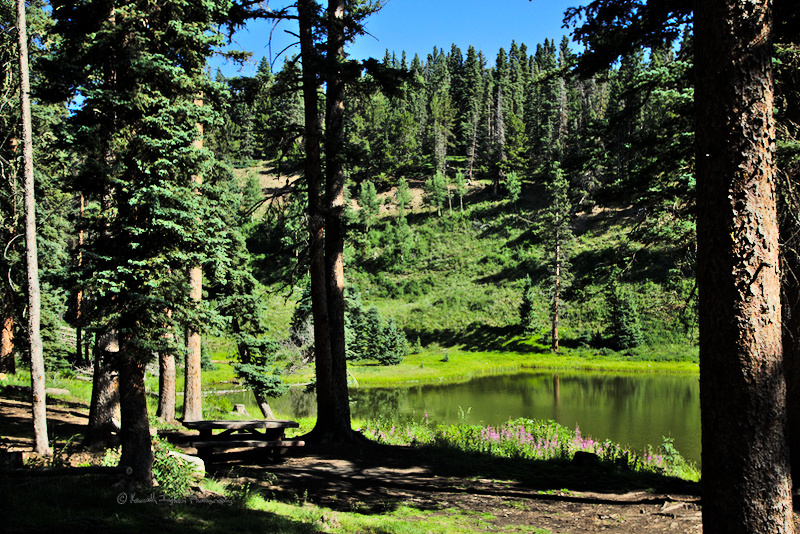 From US 285 north of Tres Piedras, turn on forest road 87 right before San Antonio mountain (a large, extinct volcano). Stay on 87 for about 25 miles. Turn right on the road when the sign indicates Lower Lagunitas. No sign anywhere indicates that you have arrived at the campground. You just see a vault toilet and you are there. Note that the road up to the campground can be rough requiring high clearance. However, when we were there, a passenger car made it. The primary draw of these campsites is the lake access, as you can see in the background of this photo of one of the campsites. Also in this photo, you can see where the Upper Lagunitas campground is. It is along the ridge on the other side of the lake. 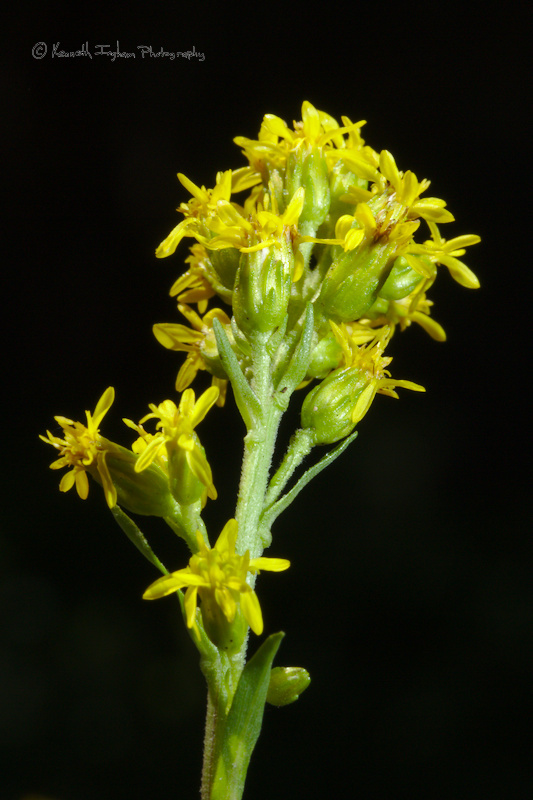 Another reason for coming to this campground is the amazing diversity of wildflowers, such as this narrow goldenrod (Solidago simplex). 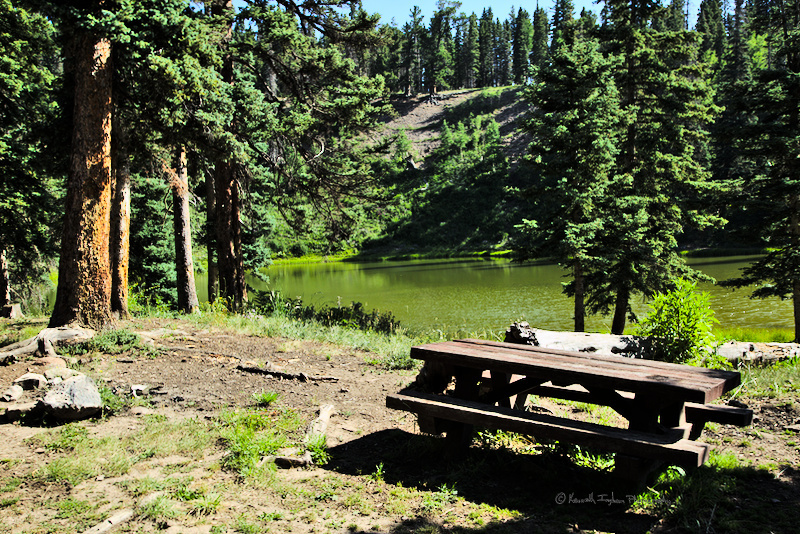 Add your comments about the Lower Lagunitas campground.